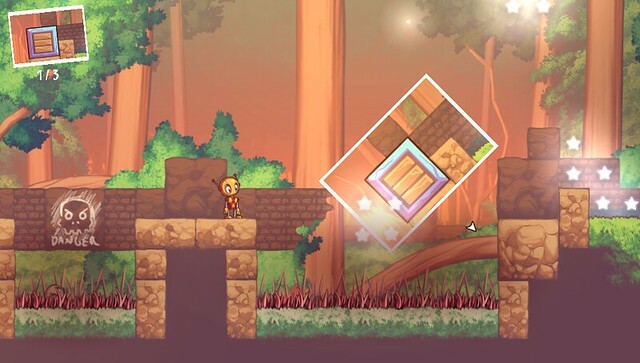 I’m proud to announce that Snapshot, our 2D puzzle platformer, is coming to PS Vita and PS3 (with cross-platform saves) this fall. In Snapshot, you control a robot named Pic. Pic carries a high-tech camera that can “capture” and remove objects and parts of the environment. You can then paste the picture back into the world causing all the objects to come tumbling back out. If you’re looking for a new puzzle game with a twist, keep reading! The game begins with Pic powering on for the first time in a dusty abandoned laboratory. Uncertain about his purpose and why he was built, he wanders into the forest that surrounds the laboratory. This is where you’ll first start to use your camera to take photographs of objects. 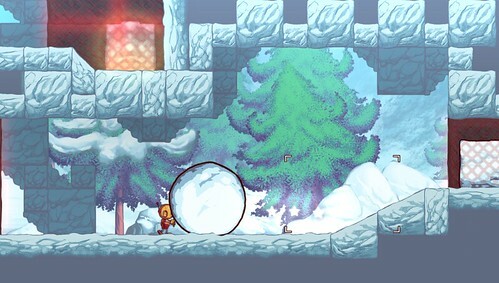 The first chapter of the game will hit you with a series of puzzles involving moving objects around within the levels, and it’s easier than you think. If you want to reposition a box, simply snap a photo to capture it, then paste the picture back into the world and watch the box fall back out of it. As you progress through Snapshot you’ll use the camera in new and interesting ways, like taking photographs of light and using it to interact with physics. Your camera even captures an object’s momentum. This, combined with the ability to rotate photographs as you paste them, leads to more complex and interesting gameplay. For example, if a snowball is falling when you snap a photo, the snowball will hurl upwards if you paste that photograph back into the world upside-down. You can even use this to take photographs of enemy projectiles and aim them right back at them! 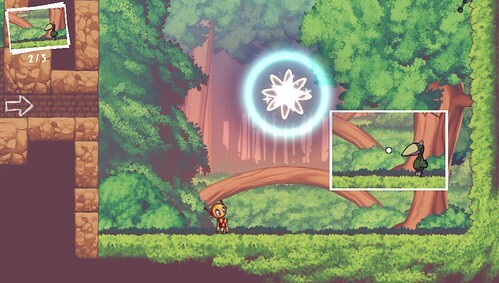 Snapshot is the first game developed by our small indie studio, Retro Affect. The sounds of Snapshot are created by the amazing Jordan Fehr, and the incredible music is composed by Wil Whitlark. Leave any comments or questions you may have in the comments below and I hope to bring you more Snapshot related news both here and at our official site as we get closer to our PSN launch later this year! Isto já chegou a sair? Eu vou re-começar a jogar no PC. Isto seria sem duvida uma bela aquisição para quem tem a Vita.